The first time I heard the phrase “bridge to nowhere” was in my first semester of college in Louisiana. Also called the “Sunshine Bridge,” this crossing of the Mississippi became the punchline of a joke because it was built before there were highway connections to it on both banks of the river. The allegation was that Governor Jimmie “You are my Sunshine” Davis had put the bridge where it would financially benefit his political allies rather than best serve the people of Louisiana. The phrase reappeared in recent years as description of a boondoggle public works project in Alaska. 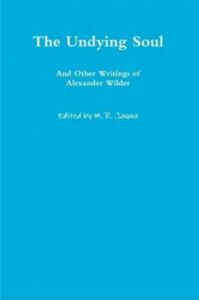 But for me, working with the letters of Alexander Wilder to Thomas Moore Johnson, I’ve wondered if this correspondence is a “bridge to nowhere” in terms of potential readership, since both Wilder and Johnson have been out of print for a century– so no one will care about their relationship. But in 2015, publication of the Collected Works of Thomas Moore Johnson, the Great American Platonist by Prometheus Trust brought back one of our heroes to print for the first time in a century. Important and valuable as that project was, it is equaled by Mark Jaqua’s bringing Alexander Wilder back into print in 2016 and 2017, which amounts to four volumes of about 400 pages each. The editorial contributions are worthy of the texts and add to the reader’s enjoyment. While editing the letters of Wilder to Johnson, which are almost entirely from the 1880s, I felt that both these men were erudite and honorable, but perhaps so focused on highly technical questions of Greek philosophy that modern readers couldn’t relate. The striking revelation of Jaqua’s series for me is that what I considered a sequel to Wilder’s literary career is actually more of a prequel. Even though he was over 60 in 1886 when his correspondence with Johnson nearly stopped, Wilder’s literary productivity was just beginning. The majority of the longer articles in Jaqua’s four volume reprint series were written in Wilder’s 70s and 80s. And instead of the stale preaching on behalf of this or that belief system we might expect from a man of this age, Wilder has a voice that is fresh, accessible, wide-ranging in explorations, and most of all RELIABLE. Although his writings for Johnson’s publication in the 1880s are as challenging and specialized as his letters of the period, in the 1890s and 1900s Wilder became a much more popularly-accessible author both in subject matter and style. Although as a historical researcher I’d have preferred a chronological arrangement of the articles rather than by subject, as a spiritual seeker I commend Mark Jaqua for bringing back into print a 19thc writer whose voice is more fresh and compelling than any of his “movement leader” contemporaries in Theosophy, Spiritualism, New Thought or Christian Science. My tribute to Jaqua’s labors will be to quote his Wilder series in future blog posts. Meanwhile, and for what it is worth, my opinion as an individual is that Wilder deserves appreciation in the 21st century more than all those who were promoting idiosyncratic 19th century belief systems that exalted themselves as spiritual authorities. Wilder didn’t care about competing 19thc belief systems nearly as much as he cared about ancient wisdom. Nor did he evince any “I’m the world’s greatest authority” egomania. That makes him, for this 21st century seeker, a far more reliable and unbiased guide than any of his contemporaries. Of course he had his biases, as we all do. But in his letters to Johnson he consistently comes across as the best friend an esoteric scholar and seeker could have wished for, someone spotlessly honest and sincere and generous in all his dealings. This makes me welcome publication of his writings in this new series, as a rare combination of historical significance, spiritual inspiration, and engaging readability.